Hawaii has some of the most famous surf spots in the world, but they can also be the most intimidating and deadly. With Hawaii’s often huge waves, you need to know where to surf as a first-timer. For those who wanting gentler breaks or more laid-back waves, there are a number of Hawaii surf spots for beginners. One of the best things novices can do is hire a professional to basic skills and techniques. 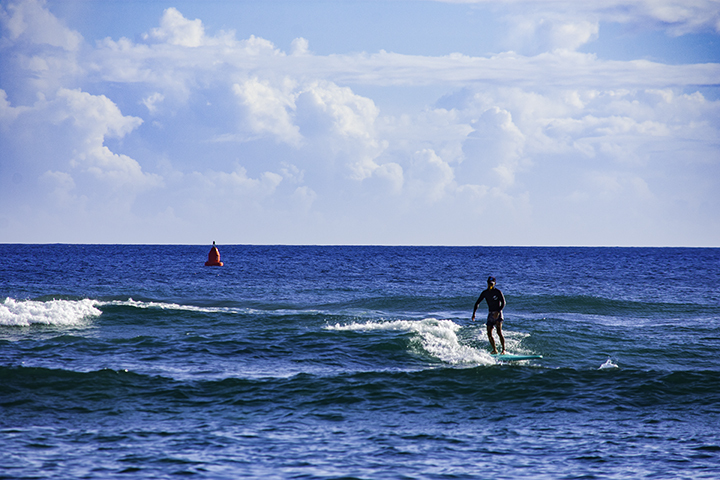 Many believe a surf lesson affords people the experience equivalent to 6 to 8 hours of surfing. So investing in lessons will certain save time and spare exhaustion. Then, you can hit the waves with better preparation. Usually surfing lessons cost about $75 per person in a group of 2 to 3 people. But many hotels offer surfing lesson packages with group or family discounts. Locals often refer to Kahalu’u Beach Park as Turtle Beach because of frequent honu (green sea turtles) sightings. This park is near Kona, south of the Kailua Village. It has small to moderate waves, which are ideal for those new to the sport. The North Shore of Oahu is not limited to Pipeline, Sunset Beach and Rocky Point. Surprisingly, there are nearby spots with more subtle breaks. Kawela Bay is known for having consistently small, gentle waves. The beach at Turtle Bay Resort can get windy as the northernmost point on the island. But here, the waves are small to medium sized and is a great place to test new skills. Since most of the surfers at this beach are resort guests, you won’t be vying against experienced surfers. For those on the south side of Oahu, Waikiki is a classic starting point for surfers of all levels. Lessons are easy to find here. Other ideal areas are Point Panic, Publics and Canoes. When in doubt, chat with your hotel concierge about the nearest beaches for beginning surfers. On the western side of Maui, you can try one of the many surfing schools in Lahaina. Here, you can learn how to avoid the reef, when to paddle out and which waves to wait for. This is the perfect place for children to learn the sport of surfing. Another ideal beach near Lahaina is Kihei Beach, which has small breaks and offers smooth rides. Other first-time surf spots in Maui are Launiupoko State Beach, Grandma’s and Wailea Beach. One of the best beaches for beginning surfers is Kiahuna Beach near the southeaster side of the island. Many surf instructors take their rookie students here to build confidence and improve their skills. Lemon Drops on the south shore beach is another great place as is Salt Pond near Port Allen Harbor. Those staying on the northern most part of the island can enjoy the gentle waves at Waiohai Beach.